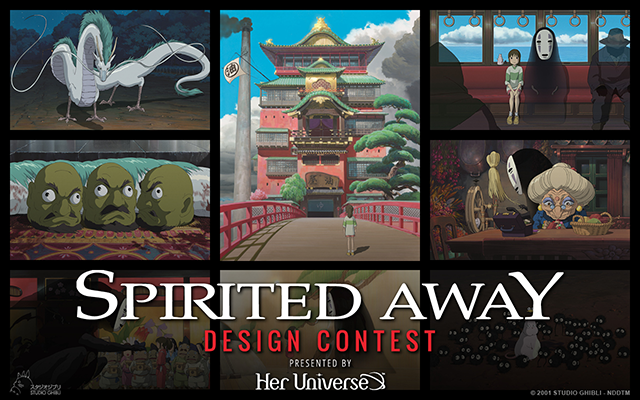 Welcome to the Spirited Away Design Contest – presented by Her Universe and Fan Factory! from Hayao Miyazaki's Studio Ghibli classic. 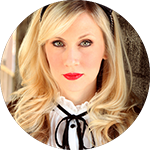 Known to Star Wars fans as the voice of Ahsoka Tano on the Star Wars animated series, actress and entrepreneur, Ashley Eckstein, also founded fangirl fashion company and lifestyle brand, Her Universe. Additionally, she is the voice of Mia the bluebird on Disney's Sofia The First, Dagger on Disney XD's Ultimate Spider-Man, the voice of Cheetah on DC Super Hero Girls and was also heard on the big screen as the voice of Yaeko in the English adaptation of Studio Ghibli's beloved film Only Yesterday. A recognized personality in the “geek world” and an in-demand actress and host for Disney, HSN and more, Ashley now adds author to the list with the May release of her inspirational new book, "It's Your Universe: You have the Power to Make It Happen" from Disney Publishing. Married to former Major League Baseball player and World Series MVP, David Eckstein, Ashley and David reside in Orlando, FL. Ashley Taylor is a Freelance Designer and Illustrator living in Southern California. Throughout the years, she has worked with various studios, celebrities and properties including Disney, Her Universe, Lucasfilm, Hot Topic and Studio Ghibli. 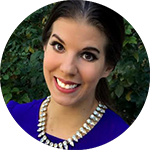 Ashley is featured weekly on the Disney Parks Blog and has also been featured on HelloGiggles.com, Disney Style and Nerdist.com. Ashley is also a contributing artist to The WonderGround Gallery at Downtown Disney and Disney Springs. 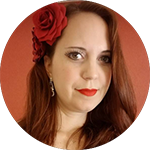 Crystal Hidey is the Licensing Specialist for Hot Topic and Her Universe. In her free time she enjoys swing dancing, vintage fashion, and watching movies. A big fan of Howl's Moving Castle, Crystal aspires to be as sassy as Calcifer. Create an original piece of art inspired by Spirited Away to be used on licensed product if the submission wins. Only designs pertaining to the characters, backgrounds and story elements form the film "Spirited Away" may be submitted for this contest. Do not mix "Spirited Away" elements with elements from any other film, show, or other content. Editorial used on designs should be taken directly from the film. Do not use any copyrighted, 3rd party, obscene or inappropriate content, language or imagery. They will not be considered. Winning submissions are intended to become officially licensed product. . Obscenity, 3rd party infringement, or copyrighted content, it will NOT be considered. Any art submission that uses Japanese editorial may be asked to provide the English translation. Do not incorporate any other brands or product with Spirited Away; they cannot appear to be endorsing another brand or featured with another brand. Spirited Away Design Contest begins September 18, 2018 and ends October 16, 2018. Must be age of majority or older to enter who, at the time of entry, are legal residents of and are physically located in the United States, the District of Columbia or Puerto Rico. One (1) grand prize winner will win $2,000 and no fewer than four (4) finalists will each win $300. Ten entries per person during the Contest Period. Total ARV of all prizes is $3,200. Void where prohibited. See Official Rules for additional eligibility restrictions and complete details. Sponsored by Hot Topic, Inc. and BoxLunch 18305 E. San Jose Ave, City Of Industry, CA, 91748 United States ("Sponsor") and administered by Fan Factory, ("Administrator"). 1. CONTEST PERIOD: Submissions will be accepted starting September 18, 2018 at 12:00:00 am Pacific Time ("PT") and ending October 16, 2018 at 11:59:59 pm PT (the "Contest Submission Period"). The judging will take place beginning on: January 4, 2019 through January 11, 2019.
or their respective parents, affiliates, subsidiaries, franchisees, or service agencies (collectively "Contest Entities"); (b) individuals engaged in the development, production or distribution of materials for the Contest or engaged in the administration or execution of this Contest (all such individuals and entities collectively referred to herein as the "Contest Entities"), and (c) persons who are or purport to be immediate family members (defined as biological or step-mother, father, sister, brother, daughter, son, dependent or spouse of any of the foregoing, regardless of where they reside) of any person in any of the preceding categories, regardless of where they live, or who reside in the same household (i.e., live in the same household for at least 3 of the 12 months preceding the start of the Contest Submission Period, whether related or not) as any person in any of the preceding categories. This Contest is subject to all applicable federal, state, and local laws and regulations. Void where prohibited. Licensor is not responsible for the collection, submission or processing of entries, the selection of winners, the provision or delivery of prizes, or the administration of the Contest. HOW TO ENTER: During the Contest Submission Period, enter online by downloading the submission kit and digitally uploading up to ten (10) designs at http://spiritedawaydesigncontest.fanfactoryart.com. Please click if you would like to download a submission kit. In order to submit, contestants must visit the submissions page during the Contest Submission Period and follow the on-screen instructions to upload their original artwork and complete an official entry form, including agreeing to the terms of the user generated content submission agreement ("Submission Agreement") and click the "Submit Your Design" button to complete the submission form. The uploaded original artwork together with the Submission Agreement and official entry form shall be collectively referred to as the "Entry." Only ten (10) entries per person will be accepted. All online entries must be received no later than 11:59:59 PM PT on October 16, 2018. Attempts made by the same individual to enter by using multiple e-mail addresses/social media accounts or otherwise will be disqualified. Mass entries, or entries generated by a script, macro or use of automated devices will be disqualified. Winning designs may be used on product and featured in Hot Topic/BoxLunch stores and websites. From January 4, 2019 to January 11, 2019, a panel of qualified judges to include representatives of the Sponsor will judge all of the eligible Entries received during the Contest Submission Period and will select up to one (1) winner and four (4) runners up based on the judging criteria described below. Judging Criteria: (each criterion is followed by its weight in parentheses) submissions digitally uploaded to http://spiritedawaydesigncontest.fanfactoryart.com must depict the character(s) from the Licensor franchise Spirited Away. Submission will be judged based on (a) Creativity (25%), (b) Originality (25%) and (c) Fits the theme (50%). In the event of a tie, an additional, "tie-breaking" Contest Judge will determine the winning Entry based on the criteria listed herein. The grand prize winner and finalists will be eligible to win the Prizes described below subject to verification of eligibility and compliance with these Official Rules. The Contest Judges' decisions shall be final and binding. 5. PRIZE: One (1) Grand Prize and four (4) runners up prizes are available.. Prize will consist of: One (1) grand prize winner will receive $2,000; and four (4) runners up at $300 each. TOTAL APPROXIMATE RETAIL VALUE OF ALL PRIZES: $3,200. Winners are not entitled to exchange or transfer prizes or to obtain cash or other substitutes, but Sponsor in its sole discretion may substitute prizes of equal or greater value. 6. WINNER NOTIFICATION: Winners will be notified via email beginning on or about April 4, 2019 with instructions on how to be confirmed as a winner and claim their prize. Potential grand prize winner will be required to execute and return an affidavit of eligibility, a liability release, a certificate of authorship documentation assigning all rights, copyright, title and interest in the Entry to Licensor (the "COA"), a W9 form, and, where imposing such condition is legal, publicity release, within the time period specified by Sponsor. Failure to complete and return any of the aforementioned documentation within the allotted time period specified by Sponsor shall result in such Potential Grand Prize Winner's disqualification from the Contest. If a Potential Winner is found to be ineligible or not in compliance with these Official Rules, declines to accept a prize, or Sponsor is unable to contact a Potential Winner within three (3) business days, or in the event that a prize notification or prize is returned undeliverable, the prize will be forfeited and, at the Sponsor's sole discretion, prize may be awarded to an alternate Potential Winner. Potential Winners may be required to furnish proof of identification. If the Potential Grand Prize Winner's entry is accepted for use by Sponsor and Licensor, such Potential Grand Prize Winner hereby irrevocably, in perpetuity assigns any and all rights to the entry to Licensor including all copyrights. At the time Potential Grand Prize Winner is notified that their entry has been selected as the Contest's winning entry, the Potential Grand Prize Winner agrees to execute such documents as requested of them by (including, without limitation, the COA) to effect/confirm the rights assignment to Licensor. 8. The Official Rules and the Contest are governed by US law and are subject to all applicable federal, state and local laws and regulations. All issues and questions concerning the construction, validity, interpretation and enforceability of the Contest Official Rules, or the rights and obligations of entrant and Sponsor in connection with the Contest, shall be governed by, and construed in accordance with, the laws of the State of California, U.S.A., without giving effect to the conflict of laws rules thereof, and any matters or proceedings which are not subject to arbitration as set forth in the above of these Official Rules and/or for entering any judgment on an arbitration award, shall take place in the State of California, in the City of Los Angeles. 9. Sponsor reserves the right in its sole discretion to cancel, modify or suspend this Contest at any time if fraud, technical failures, including any network server or hardware failure, viruses, bugs, errors in programming, or any other errors or other causes corrupt the administration, security, integrity or proper play of the Contest and, if cancelled, at Sponsor's discretion, to select the Winners from all eligible entries using the procedure outlined above. 10. Sponsor and the Contest Entities do not warrant that access to the Contest will be uninterrupted. Sponsor and the Contest Entities are not responsible for any problems that may arise, including but not limited to; (a) lost, interrupted, inaccessible or unavailable networks, servers, satellites, Internet Service Providers, Websites, or other connection, availability or accessibility problems arising in connection with or over the course of the Contest; or (b) communications failed, jumbled, scrambled, delayed, or misdirected computer, telephone or cable transmissions or hardware or software malfunctions, failures or difficulties; or (c) failure of personal computers and/or software and hardware configurations, any technical malfunctions, failures, or difficulties, printing errors, clerical, typographical or other error in the offering or announcement of any prize or in any prize notification documents; or (d) for any other errors of any kind relating to or in connection with the Contest, whether human, mechanical, clerical, electronic, or technical or otherwise, including, without limitation, any errors which may occur in connection with the administration of the Contest, the processing of registrations or entries, the uploading of submissions, the judging of entries, the tabulation of scores, the announcement of the prizes or in any other Contest-related materials; or (e) the incorrect or inaccurate capture of information, or the failure to capture any information in connection with the Contest; or (f) damage to a user's computer systems, networks, or data occasioned by participation in this Contest or downloading any information necessary to participate in this Contest. 11. Any attempt by an entrant or other individual to deliberately damage any website or undermine the legitimate operation of this Contest, including but not limited to any fraudulent claims, is a violation of criminal and civil laws. Should such an attempt be made, Sponsor reserves the right to seek remedies and damages from any such individual, to the fullest extent permitted by law, including criminal prosecution. Entrant engaging in any of the foregoing activities may be disqualified, will forfeit any prize(s) won, and all associated Entries and/or scores will be void. 13. The invalidity or unenforceability of any provision of these Official Rules shall not affect the validity or enforceability of any other provision. In the event that any provision is determined to be invalid or otherwise unenforceable or illegal, these Official Rules shall otherwise remain in effect and shall be construed in accordance with their terms as if the invalid or illegal provision were not contained herein. In particular, Sponsor's employees are not authorized to waive, modify or amend any provision or provisions of these Official Rules in any manner whatsoever. 14. This Contest is solely sponsored by Hot Topic, Inc., 18305 E. San Jose Ave, City Of Industry, CA, 91748 United States and Administered by Fan Factory. 15. For any legally required notice of the Prize Winner, send a self-addressed postage stamped envelope to: Spirited Away Design Contest – Winner List Request", 18305 San Jose Ave, City of Industry, CA 91748, to be received by December 31, 2018. Winner's notice will be sent after all prizes have been awarded. 16. Odds of winning depends on the number of entries received, and the judged level of creativity, originality and relevance, per the judges' criteria, of the entry submission. 17. To see how we use personal information obtained in connection with this Contest, please visit http://www.boxlunch.com/customer-service/privacy-policy/ or http://www.hottopic.com/customer-service/privacy-policy/ Personal information may be collected, used or disclosed. Neither Sponsor, Administrator nor Contest Entities will sell, share or otherwise disclose personal information of entrants with third parties or agents, other than to third parties or agents engaged by Sponsor to fulfill the above purposes or as permitted or required by the applicable laws. If you are selected as a winner, your information may also be included in a publicly-available winner's list.